I have noticed that when babies are born, the first things we concern ourselves with is if they are healthy, after we find out that all is good it seems like we spend the next 12 years or so teaching them, worrying about them, or wishing and praying that they sleep! Sleep is a key to so many things in life and we know it is really important for our kids to get enough sleep. After the age of 13 your problem shifts to getting them out of bed! Let’s face reality though, we want our kids to sleep so that we can sleep, we want to sleep for a long time, we want hours and hours and we would love to get up around noon, but the truth is that is just not going to happen. When I was asked to review this great clock for our Holiday Gift Guide, I thought I might have some hope! 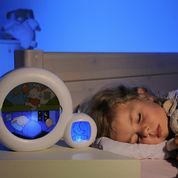 The Kid Sleep Moon is the first nightlight with an alarm display for children. In a playful and educational way, it solves this problem that every very young child has: is it really time to get up or do I have to sleep a bit longer? How awesome is that? One continuous thing I see with having a toddler is they want to do and have everything the grown ups do, from make up, soap, food, beds, and even phones and gadgets. How awesome is it that we have a tool that is an alarm clock just like the big guys made just for them. 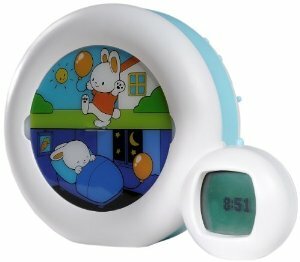 The Kid Sleep Moon has 3 settings for nighttime, nap and weekend, 4 choices of alarm sounds (or the choice of no alarm), and 4 levels of brightness to choose from. 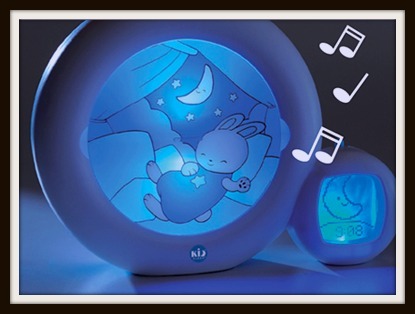 The Kid Sleep Moon helps children fall asleep with 4 different choices of lullabies. The Kid’Sleep Moon also offers the Smart Sunset “Go To Sleep” function and the Smart Moonset “Wake-Up Process”, which gives kids a 10 minute warning for sleep time and get up time! The Kid’Sleep Moon has a new menu for very easy setting! I think this is a fabulous gift for toddlers! There are a lot of gifts out there that will be played with for a few days or weeks and then set aside to not played with again, this can be used daily. It is almost more of a gift for parents then it is for kids, but I think your little one’s are going to love it. You can win one here on our Great Holiday Gift Guide Giveaway! Good Luck and Happy Holidays! Next post: Infantino Squeeze Station for Baby Food! Great Mom Gift! We, currently, do not use a night light- but we need one!! Yes, we use a night light for our son. We use the night lights from the dollar store. I would love to have this for the grandbaby. We are not using a night light yet.